I love Peter Pan collars as much as you do, but there’s no way on earth they can continue to thrive past September. It’s come to the point where, when I performed a search for “medic” collar and then for “cossack collar,” some version of the Peter Pan–whether pointed (which isn’t a true Peter Pan) or rounded–came up. It’s all too much. I crave the next thing. What do you think it will be? Here are some of my wishes. 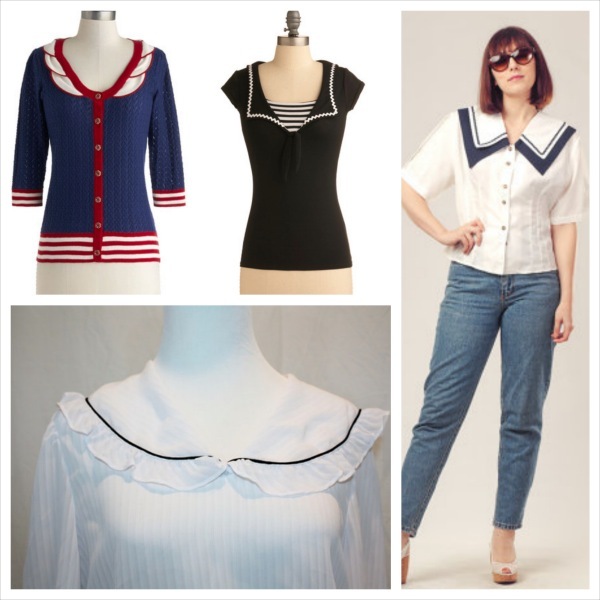 Clockwise from top left: Modcloth: Ferry So Much Cardigan, $69.99; Modcloth: Sail Into Slendor Top, $37.99; Etsy, $15; Etsy, $24. Clockwise from left: Lauren Ralph Lauren Dress Cowl Neck Evening, $112.50; Free People: We the Free Malibu Cowl, $29.95; Topshop: Tie Dye Cowl Neck Dress by W, $68; Asos.com: Dagmar Lace Knit Cowl Neck Tank, $81.46. Clockwise from left: Forever 21: Cascading Ruffle Trimmed Shirt, $17.80; LiZi Creamy Butterfly Lace Top, $59.95; Polka Dotted Cascading Flounce Cotton Blouse with Puff Sleeves, $13.50; Levi’s Shirtdress with Jabot, £ 80.00. What kind of collar would you like to see next?